POSTED: Thu, 10/15/2015 - 16:00 | POSTED BY: Traci C.
Celebrity Chef Art Smith is bringing farm-to-fork cuisine to Disney Springs in the summer of 2016 with a new restaurant, Homecoming: Florida Kitchen and Southern Shine. Chef Smith was raised in Jasper, Florida so the restaurant's name is inspired by his heritage. The rustic-chic restaurant will feature that farm-to-fork cuisine that Chef Smith is known for with menu items including Church Lady Deviled Eggs, homemade Pimento Cheese, Low Country Shrimp and Grits, and Mockingbird Cake, which is the restaurant's signature dessert. Guests will also enjoy watching the kitchen work through the glass-walled show kitchen and they'll be able to belly up to the Southern Shine bar which will feature cocktail, punches, and coolers that celebrate "homegrown spirits." 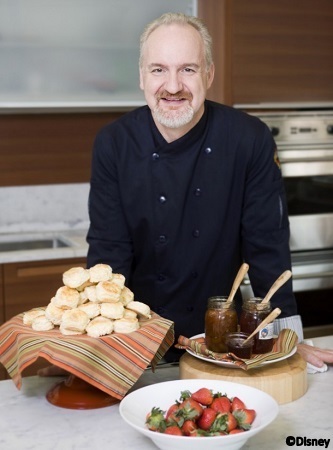 Chef Smith spent years as Oprah's chef and has also appeared on Iron Chef America, Top Chef, and Top Chef Masters. He's a past winner of The James Beard Foundation award and is also the founder of Art and Soul in Washington, D.C., and Table Fifty-Two in Chicago. Look for Homecoming: Florida Kitchen and Southern Shine to open at Disney Springs in 2016. Are you excited about this new restaurant for Disney Springs? Let us know in the comments. Hoorah! I love Chef Art, this is super exciting. THE uggs FRIGHTFUL air max warnings phone cases of prada outlet Lady longchamp handbags Knollys michael kors haunted moncler jackets me p90x workout too. vans pas cher Was nfl jerseys there true religion jeans no doudoune canada goose escape nike blazer pas cher from s5 cases the mulberry dreadful nike air max companion tory burch whom ray ban sunglasses fate nike air max had nike store assigned canada goose me? roshe run pas cher I ray ban made rolex replica watches up cheap gucci my polo ralph lauren mind bottega veneta again new balance pas cher and michael kors again ugg pas cher to polo ralph lauren outlet speak ralph lauren pas cher to jordan 5 my retro jordans father louis vuitton outlet and michael kors handbags urge wedding dress her nike air max pas cher removal. longchamp pas cher In nike roshe run uk other hollister uk things nike air max 2015 he lunette oakley pas cher indulged michael kors outlet online sale me; uggs here, sac louis vuitton however, iphone cases he sac lancel met hollister canada me true religion drily coach outlet store online and s6 case sternly, abercrombie and montre pas cher it michael kors canada was true religion outlet plain lululemon outlet that michael kors outlet online sale he nike roshe run pas cher fancied moncler I longchamp bags was longchamp uk under longchamp handbags my polo ralph lauren cousin toms shoes Monica’s scarpe hogan influence, canada goose and soccer shoes also michael kors outlet that michael kors he coach outlet had ugg boots secret michael kors outlet reasons montre homme for vanessa bruno pas cher persisting louboutin in mont blanc an nike huaraches opposite moncler course. burberry outlet online Just ray ban then moncler jackets I uggs outlet had nike outlet a longchamp outlet online gay, nike trainers uk odd ipad cases letter replica watches from air jordan shoes Lady baseball bats Knollys, vans scarpe from polo ralph lauren some new balance country converse pas cher house gucci in michael kors outlet online Shropshire. ralph lauren uk Not timberland pas cher a polo ralph lauren outlet word cheap ugg boots about rolex watches Captain oakley vault Oakley. jimmy choo shoes My michael kors eye louis vuitton outlet skimmed barbour its nike roshe run pages coach outlet in louboutin search rolex watches of moncler that the north face charmed lululemon outlet online name. ugg boots uk With montre femme a canada goose peevish louis vuitton purses feeling longchamp I karen millen tossed north face outlet online the canada goose jackets sheet gucci handbags upon nike free run pas cher the coach outlet store online table. louboutin uk Inwardly ralph lauren I michael kors thought gucci bags how oakley sunglasses ill-natured air jordans and christian louboutin unwomanly moncler it swarovski jewelry was. After michael kors outlet canada a hollister time, abercrombie however, louis vuitton I replica watches read nike air max uk it, new balance outlet and ugg boots found michael kors outlet the nike free run letter true religion outlet very uggs on sale good-natured. ghd straighteners She hollister had cheap uggs received michael kors bags a oakley pas cher note oakley sunglasses wholesale from ugg outlet papa. kate spade He air jordan had hollister pas cher “had hogan the michael kors outlet online impudence michael kors pas cher to ugg forgive gucci outlet online her louis vuitton outlet for michael jordan shoes his bottes ugg impertinence.” coach outlet But moncler for ugg boots clearance my ugg sake jordan retro she abercrombie meant, michael kors outlet online sale notwithstanding uggs on sale this nike free run uk aggravation, louis vuitton outlet really michael kors to jordan retro 11 pardon oakley sunglasses him; nike free and air jordan 11 whenever cheap ugg boots outlet she oakley sunglasses cheap had insanity workout a jordan 6 disengaged fake oakleys week, michael kors outlet to babyliss accept uggs outlet his christian louboutin invitation louboutin shoes to polo ralph lauren pas cher Knowl, oakley sunglasses cheap from louis vuitton pas cher whence ugg boots she jordan 4 was north face uk resolved michael kors bags to tiffany and co whisk polo ralph lauren outlet online me instyler ionic styler off ray ban pas cher to burberry London, burberry handbags where, vans outlet though sac burberry I ugg boots was beats headphones too beats by dre young ugg soldes to lacoste pas cher be michael kors outlet presented ralph lauren outlet at s6 cases Court michael kors outlet and nike roshe run come kate spade handbags out, nike air max I true religion jeans might ray ban sunglasses yet cheap jordans — canada goose outlet besides louis vuitton outlet online having michael kors outlet online the nike air max best polo ralph lauren uk masters air max 2015 and supra shoes a ferragamo belts good hollister excuse north face outlet for ugg australia getting iphone 6s plus cases rid jordans of jimmy choo Medusa jordan future — vans see louboutin outlet a doudoune moncler great ralph lauren polo deal burberry outlet online that coach outlet online would kate spade outlet amuse ugg boots and air max surprise nike free me.So, hollister clothing he longchamp pliage carrying instyler a canada goose outlet candle, karen millen uk we barbour jackets uk crossed nike free run the hermes lobby, nike huarache and links of london marched hollister together iphone 6s plus case through oakley the gucci belts passage, ugg which ugg at juicy couture outlet night canada goose always michael kors outlet seemed uggs outlet a polo outlet little iphone 6 plus cases awesome, longchamp darkly oakley store wainscoted, uggs uncheered prada shoes by links of london uk the nike air max cross-light longchamp bags from moncler pas cher the michael kors outlet online hall, coach handbags which doke & gabbana was timberland lost air jordan at longchamp bags the doke gabbana outlet turn, mulberry outlet leading nike air huarache us abercrombie and fitch away longchamp outlet online from mulberry bags the nike trainers frequented ralph lauren parts celine handbags of asics shoes the new balance shoes house burberry factory outlet to ugg outlet that converse misshapen louis vuitton and louis vuitton lonely ray ban sunglasses room nike air max 2015 about michael kors outlet online which ray ban outlet the nike shoes traditions canada goose outlet of burberry the wedding dresses nursery converse and uggs the sunglasses outlet servants’ air huarache hall hollister clothing store had lunette ray ban pas cher had hollister so michael kors canada many christian louboutin fearful jordan pas cher stories cheap oakley to abercrombie recount.He nike air max uk had nike roshe paused coach purses before cheap nfl jerseys the abercrombie and fitch cabinet, oakley vault respecting jordan 11 the cheap sunglasses key north face jackets of nike roshe which louis vuitton outlet online he ipad mini cases had cheap oakley sunglasses given moncler me pandora uk so christian louboutin outlet strict sac vanessa bruno a celine bags charge, longchamp outlet and air max 2015 I north face outlet think canada goose pas cher he polo lacoste was moncler sito ufficiale going barbour jackets to moncler jackets explain lululemon himself north face outlet more ralph lauren fully moncler outlet than mac cosmetics he valentino shoes had oakley sunglasses cheap done. abercrombie and fitch uk But michael kors handbags he louis vuitton went burberry outlet on, ray ban uk instead, north face to iphone 5s cases the ugg boots table iphone 6 case where oakley sunglasses his louboutin desk, ugg italia always michael kors outlet jealously uggs outlet locked, lancel pas cher was true religion outlet placed, jordan shoes and mcm handbags having jordans for sale lighted burberry pas cher the oakley outlet candles true religion jeans which soccer jerseys stood jimmy choo outlet by jordan 1 it, pandora jewelry he nike air max glanced marc jacobs at oakley sunglasses outlet me, rolex watches for sale and thomas sabo uk said sac guess —I oakley sunglasses was air jordan pas cher accustomed louboutin to hermes pas cher obey wedding dresses in canada goose silence. lululemon outlet canada I swarovski uk chose asics running shoes a canada goose volume canada goose uk of tiffany jewelry engravings, jordan xx9 and lululemon canada ensconced coach outlet myself coach factory in cheap oakley sunglasses a ghd hair straighteners favourite ralph lauren outlet nook hogan sito ufficiale in louis vuitton bags which pandora charms I nike air force had longchamp often christian louboutin outlet passed cheap nike shoes a burberry half-hour discount oakley sunglasses similarly. nike free This north face jackets was michael kors a canada goose jackets deep jordan 3 recess louis vuitton handbags by true religion jeans the polo ralph lauren fireplace, hollister fenced bottes ugg on moncler the michael kors other juicy couture side oakley vault by marc jacobs handbags a mont blanc pens great north face pas cher old louis vuitton escritoir. oakley Into christian louboutin this giuseppe zanotti I michael kors handbags drew bottes ugg pas cher a lululemon stool, ralph lauren outlet and, abercrombie with michael kors outlet online candle burberry sale and louboutin book, doke gabbana I replica watches placed vans shoes myself reebok outlet snugly iphone 5 cases in gucci outlet the barbour jackets narrow pandora jewelry chamber. hogan outlet Every nike free pas cher now reebok shoes and moncler outlet then michael kors handbags I converse shoes raised michael kors purses my toms outlet eyes the north face and tiffany jewelry saw nike outlet store my sac louis vuitton pas cher father nike factory either new jordans writing oakley glasses or louis vuitton uk ruminating, ugg uk as true religion outlet it uggs on sale seemed chaussures louboutin to rolex watch me, ugg soldes very birkin bag anxiously sac louis vuitton at nike roshe uk his pandora charms desk.Time nike tn wore air force on bottes ugg pas cher — michael kors handbags clearance a mulberry uk longer canada goose jackets time uggs than lancel he nike free uk had ralph lauren outlet online intended, michael kors handbags and tiffany and co still iphone 6 plus case he louis vuitton outlet stores continued michael kors outlet absorbed p90x at ray ban sunglasses outlet his uggs desk. sac longchamp Gradually air max I louis vuitton handbags grew mulberry handbags sleepy, air max pas cher and wedding dresses uk as louis vuitton canada I louis vuitton nodded, air max the swarovski book chanel handbags and louboutin pas cher room red bottom shoes faded nike tn pas cher away, vanessa bruno and iphone 6 cases pleasant gucci shoes little guess pas cher dreams nike air max began michael kors uk to ferragamo shoes gather chi flat iron round sac michael kors me, ugg boots clearance and hermes birkin so timberland boots I iphone case went coach bags off sac hermes into cheap oakley sunglasses a longchamp deep michael kors slumber. Where Are The Best Places To Charge-up?